Is the Great Tribulation Only for the Jews? In just about every discussion about the rapture, you will hear mention of the Great Tribulation, the greatest persecution of Christians and Jews in world history. Many people believe that the Great Tribulation is a time of trial specifically and exclusively for the nation of Israel. Therefore, the Church will be raptured prior to this time. Does this argument hold up? “For then there will be great tribulation, such as has not been since the beginning of the world until this time, no, nor ever shall be. And unless those days were shortened, no flesh would be saved; but for the elect's sake, those days will be shortened. Then, if anyone says to you, `Look, here is the `Christ!' or `There!' do not believe it. For false christs and false prophets will rise and show great signs and wonders to deceive, if possible, even the elect. See, I have told you beforehand. Therefore, if they say to you, `Look, He is in the desert!' do not go out; or `Look, He is in the inner rooms!' do not believe it. For as the lightning comes from the east and flashes to the west, so also will the coming of the Son of Man be” (Matt. 24: 21-27). What a terrible time. Jesus tells us that the Great Tribulation will be worse than any persecution the world has ever experienced. Worse than the Spanish Inquisition. Worse than the Crusades. Worse than the Holocaust. It will be so terrible that even the elect of God will begin looking for Him at times and places where they ought not. Many will fall prey to false teachers. It is understandable, then, why many believers would want to keep the Church out of the Great Tribulation. One of the most common arguments used for this purpose is that when Jesus spoke about this terrible time, He was not talking to the Church; He was talking to Old Testament Jews. When Jesus gave the Olivet Discourse, the Church did not yet exist because He had not yet died, risen, and ascended to heaven, and the Holy Spirit had not yet been poured out at Pentecost. Therefore, proponents of this view conclude, the entire context of this discussion should only be applied to Israel. I disagree. While the audience was unaware of the future formation of the Body of Christ, Jesus certainly wasn't. He repeatedly referred to mysteries such as the sending of the Holy Spirit, His crucifixion, and the spiritual kingdom of God that were not to be understood by Jewish and Gentile believers until some time later. question from His disciples: “Tell us, when will these things be? And what will be the sign of Your coming and of the end of the age?” (Matt. 24:2). These disciples were essentially asking, “What is the sign of Your coming for us? When is the end of the age for us?” They weren't asking about when the end of the age would come for another group of people. They were asking on behalf of themselves. Jesus answers the disciples by talking about the events that lead up to, and include, the Great Tribulation. If the Church will be raptured prior to the Great Tribulation, as many believe, Jesus never answered their question. In fact, He was downright misleading. This is not an acceptable conclusion. But Jesus does answer their question. After describing the Great Tribulation, He goes on to say: “Immediately after the tribulation of those days, the sun will be darkened, and the moon will not give its light; the stars will fall from heaven, and the powers of the heavens will be shaken. 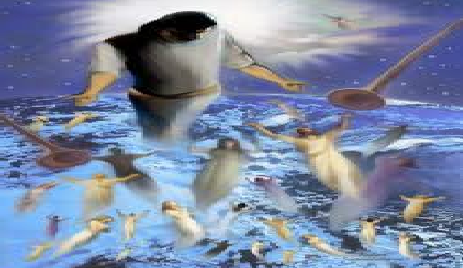 Then the sign of the Son of Man will appear in heaven, and then all the tribes of the earth will mourn, and they will see the Son of Man coming on the clouds of heaven with power and great glory” (Matt. 24: 29-31). There can be no more clear, direct response than that. The disciples asked, "When are you coming back?" Jesus told them. We know from the many, many scriptures in the New Testament (none clearer than Acts 1:9) that, when He comes back, He comes back only once. And remember, too, that Jesus was talking to believers, not unbelieving Jews. This means that the Church can expect to go through the period He just described. We see the same pattern in 1 Peter. In 1 Peter 4:7, Peter makes it clear that his frame of reference is the end times — “the end of all things is at hand” — then he goes on to admonish his flock: “Beloved, do not think it strange concerning the fiery trial which is to try you, as though some strange thing happened to you” (1 Peter 4:12). Peter then concludes, “but partake of Christ's sufferings, that when His glory is revealed, you may also be glad with exceeding joy” (v. 13). Here, we see the trial by fire immediately preceding Christ's return and the admonition not to be surprised or deceived — the same pattern as in Matthew 24. The fact that the Church will be present during the Great Tribulation is reinforced by the fact that, throughout the Olivet Discourse, Jesus kept saying, “you.” When you see the abomination of desolation, when you see these things beginning to occur. He was clearly referring to the disciples in their future identities, as members of the New Testament Church, not their identities as Old Testament Jews that they would leave behind. Robert Van Kampen, author of The Sign and The Rapture Question Answered: Plain and Simple, also points out that the Olivet Discourse is surrounded front and back with clear references to the Church: “You are Peter, and upon this rock I will build My church” (Matt. 16:18); “And if he [an unrepentant believer] refuses to listen to them, tell it to the church; and if he refuses to listen even to the church, let him be to you as a Gentile and tax collector” (Matt. 18:17); and his instructions for the Lord's Supper, which were undeniably intended for the church (Matt. 26:26–30). Indeed, the Bible teaches that the Church will endure the Great Tribulation, the greatest time of persecution and martyrdom of believers in world history. This is why Jesus tells us three times in this passage not to be deceived (Matt. 24:23-26) and not to look for Him until the appropriate time. When is the appropriate time? When the sign of the Son of Man flashes from the east to the west (Matt. 24:29). At this time, every believer will look up. Jesus will break through the clouds, with the blast of a heavenly trumpet, to take believers to glory (Matt. 24:29-31). But make no mistake: this glorious event will not occur until after the opening of the sixth seal — after Great Tribulation is complete.